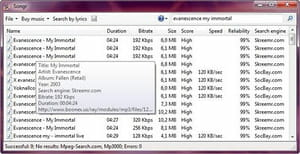 Songr is a simple and lightweight program for searching and downloading MP3 files from the Internet. It is developed and published by Songr Team. Songr does not require opening the browser to search for files. The user just needs to launch the application, type a keyword related to it and then click on the Search icon. It is also possible to launch a search by lyrics. Once all results are appearing on the program's interface, download can start. MP3 files can be transferred to the hard drives. Bit rates, duration, download speed and other relevant information can be found on the interface. All results can be downloaded in mass to the hard drives. Thanks to this option, Songr enables users to avoid time wasting. There is an option for buying music from the Internet in case the MP3 file is protected. Songr can be downloaded free of charge. This program is available in several languages. It can work with several search engines. Latest update on March 2, 2015 at 03:13 AM.